Downey Plumbing Heating & Air Conditioning is a reputable plumbing and HVAC company, having obtained the necessary knowledge and expertise to assist you with any kitchen or bathroom plumbing project. You might need only basic repairs or full installations of new plumbing fixtures, it does not matter – our professional team is at your disposal to upgrade or fix your kitchen and bathroom plumbing. Our specialists perform every task from full-scale installations of new sinks to leak repairs, fixing practically all sink types and models and restoring them back to their original state. Chips, scratches, large fixing holes or common wear can be fixed when our plumbers get down to work. Damaged porcelain, stainless steel and acrylic sinks that seem below repair will be restored with our professional touch. Faulty faucets present a common problem that often occurs in kitchens and bathrooms. Faucets are not as simple fixtures as one might think, thus restoring and replacing them can be a complex assignment. In any case if your faucet is in need of a new screw or washer, or you face water pressure problems, Downey Plumbing Heating & Air Conditioning is just one call away. Our plumbing technicians are experienced in troubleshooting most faucet-related problems, and they will eagerly fix you faucets in no time. Do you want to know which kitchen appliance is most commonly misused? It is a garbage disposal. A lot of homeowners do not have a clue about the correct use of their disposals, which are intended to handle only light food residue, and can easily get clogged when overloaded with too much food waste. If your garbage disposal is clogged or stopped working, our technicians provide garbage disposal repair/replacement services for all garbage disposal types. 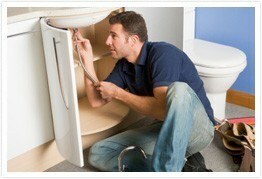 At our company we do everything from new toilet installations to fixing leaking toilets. A toilet that won’t flush is one of the most frustrating and disgusting experiences a homeowner can ever encounter. If you plunge your toilet on a regular basis, there should be a blockage in the trap or further down the drainpipe or even the sewer line. Downey Plumbing Heating & Air Conditioning can provide you with plumbing experts that can deal with clogged or leaking toilets, offering the best plumbing solutions for your home. Our team has been in plumbing business for over 80 years, helping people throughout California with their plumbing problems. Bathtub repair and shower installations also fall into the area of our expertise. To find out more about our services, contact us at Downey Plumbing Heating & Air Conditioning and we will answer all your questions as well as come to the rescue in case of a plumbing emergency.